The Haus der Kulturen der Welt is a place for international contemporary arts and a forum for current developments and discourse. Located in the capital city of Berlin, it presents artistic productions from around the world, with a special focus on non-European cultures and societies. Visual arts, music, literature, performing arts, film, academic discussions and digital media are all linked in an interdisciplinary programme that is unique in Europe. In a time when local and national issues are inextricably tied to international developments, the Haus enables the voices of the world to be heard in their great diversity and gives them a productive place in the inner-societal dialogue. In cooperation with artists and experts, it offers visitors opportunities to grapple with the conflicts, challenges and questions of our time: How do our respective living conditions impinge upon each other? What kind of a future do we want to live in? How can we shape our world more intelligently, but also more poetically? The Haus brings together artistic and social relationships in a special network that extends throughout and beyond Berlin. Here visitors can experience art as the practice of experimenting, questioning and discovering. Culture is in a perpetual state of change and comprises everyday as well as pop cultures. Working with these, the artistic formats establish connections with the visitors’ realm of experience and offer opportunities for active participation and identification. Against the backdrop of the transformation in Berlin, Germany and Europe, the Haus provides orientation in an increasingly complex world, reflecting societal and global processes from an international perspective. The Haus brings diverse societal groups in the immigrant-rich metropolis of Berlin into conversation with one another. It collaborates with universities and initiatives to involve local organizations in its international projects. The Haus is a forum and a meeting point for the many Berlin inhabitants who have close ties to cultures around the world. Through the EDUCATION programme it develops offerings for curious people of all ages and backgrounds. It opens new spaces of knowledge and aesthetic experience. Since 2002 the Haus der Kulturen der Welt has operated, like the Berliner Festspiele and the International Filmfestspiele Berlin, as a division of the non profit organization Kulturveranstaltungen des Bundes in Berlin GmbH. The Haus is financed by the State Minister for Culture and Media at the Federal Chancellery in accordance with a resolution of the Deutscher Bundestag, and receives project-related funding from the Federal Foreign Office. 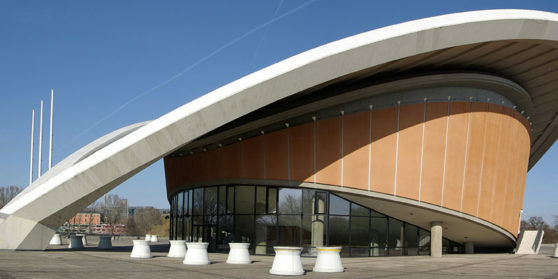 Both the administration and the event programme of the Haus der Kulturen der Welt are accommodated in the Congress Hall . This architectural landmark of Western modernism was an American contribution to the international building exhibition INTERBAU 1957 as an embodiment of the free exchange of ideas. Thus the Congress Hall was associated from the start with modern Western ideals as well as with the East-West positioning of the time. The Haus, with its visitors, artists and thinkers, subjects the history of modernity to ongoing critical review – for in our globalized world, European societies are called upon to set our self-conception in relation to, and come to terms with, the history of non-European cultures. The Haus continually strives to open up new perspectives. The EDUCATION program offers cultural education for all ages. Here participants can discover art, make music and investigate current issues. HAUSRADIO also invites active participation in its cooperative productions of live broadcasts and podcasts with Klubradio Ltd. The internationally networked partner initiative www.culturebase.net provides an online Who’s Who of non-European artists and thinkers, presenting information on more than 1,000 individuals and groups from all over the world. Not to be overlooked, the Haus’s publications are a further and lasting source of knowledge. In its 20-year history the Haus has put out some 150 works in print as well as over 40 CDs.